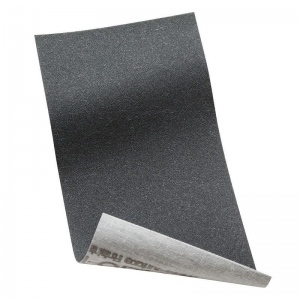 Micro-Mesh™ Regular Sheet (silicone carbide grit with standard backing), the standard grade of Micro-Mesh used for polishing and cleaning paints, wood and most metals and polymers. It is used to remove material, produce a uniformly smooth surface and polish a surface to a high gloss finish. Available in grades 1500 to 12000 (30 to 2 microns). Micro-Mesh may cost more than ordinary sandpaper, but it produces finishes 10 to 20 times finer. Micro-Mesh can be used wet or dry. By beginning with the coarser grits (1500–2400) and successfully polishing with the finer grits (3200–12000) you can produce mirror finishes on a wide variety of surfaces. Micro-Mesh is manufactured using Ultra-Flex technology. Each type is long lasting, cushioned, extremely flexible, and re-usable. The Ultra-flex properties of Micro-Mesh allows it to conform to shapes conventional products cannot, giving you additional finishing options. Micro-Mesh sheets are made with large, very uniform crystals that recede into the Ultra-Flex matrix as pressure is applied, allowing the crystal tips to all line up so they are level with the part being polished. This technology provides a more brilliant, consistent finish. Micro-Mesh does the opposite. The backing is long lasting cloth to which an ultra-flexible cushioning layer is applied. This cushioning layer will determine how far forward you can push crystals before they will penetrate the cushioning layer. On top of this layer, we have a very resilient glue, not a hard resin, but a completely flexible glue that will hold the crystals while allowing it to move and rotate. The crystals can turn in any direction without coming loose. When you start to apply pressure to sand with Micro-Mesh, the crystals will go into the cushioning layer while beginning to cut a bit. If you push harder, they will go further into the cushioning layer, which serves as a safety valve. It determines how much pressure you can exert in a downward direction. Instead of a deep scratch that sandpaper makes, Micro-Mesh produce a refined scratch that is close to a RMS of 1.0. (RMS is a measurement of surface roughness that is calculated as the Root Mean Square of a surface’s measured microscopic peaks and valleys.) The cushioning layer also allows the crystals to cut with a planing motion that leaves an extremely consistent scratch pattern and allows you to achieve extraordinary levels of gloss. Where conventional abrasives will take surfaces down 2 or 3 thousandths (.002 or .003), Micro-Mesh will take it down one ten thousandth (.0001) or less. On paint surfaces use the sheet alone without water or other lubricating fluid. For other surfaces, use water as a lubricant to extend abrasive life and cool the work surface. Keep Micro-Mesh sheets clean; contamination can cause scratches. When finished using, rinse Micro-Mesh sheets, air dry, and return them to their original packaging. Micro-Mesh is reusable! Use only micro-fiber cloths for wiping. Keep the sheets clean, wash in warm soapy water, rinse, dry and return to the package.